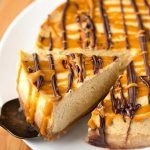 Instant Pot Pumpkin Cheesecake says “Fall is Here!” My recipe for this amazing pressure cooker pumpkin cheesecake is delicious, and has gained a lot of fans! Hello Fall! I’m a few days late, but very happy about the turning of the season! I love the cooler temperatures and changing colors of the leaves, the sweaters, boots, and of course, PUMPKIN EVERYTHING! 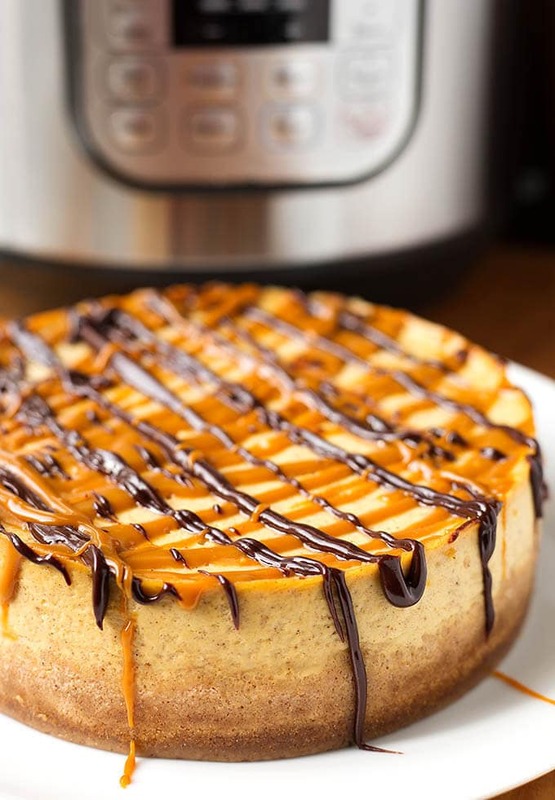 Hey, at least I waited until it was actually Fall to post this Instant Pot Pumpkin Cheesecake recipe! I adapted this pumpkin cheesecake from my Dreamy Orange Cheesecake recipe, which you also make in the pressure cooker. And which is, in fact, dreamy! 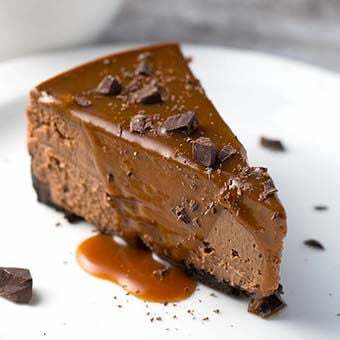 And I can’t leave out the most wonderful Instant Pot Chocolate Cheesecake. Can you tell I love cheesecake? I just don’t like the kind you buy in the store. They seem dry and bland to me. I have yet to find a good store bought cheesecake. 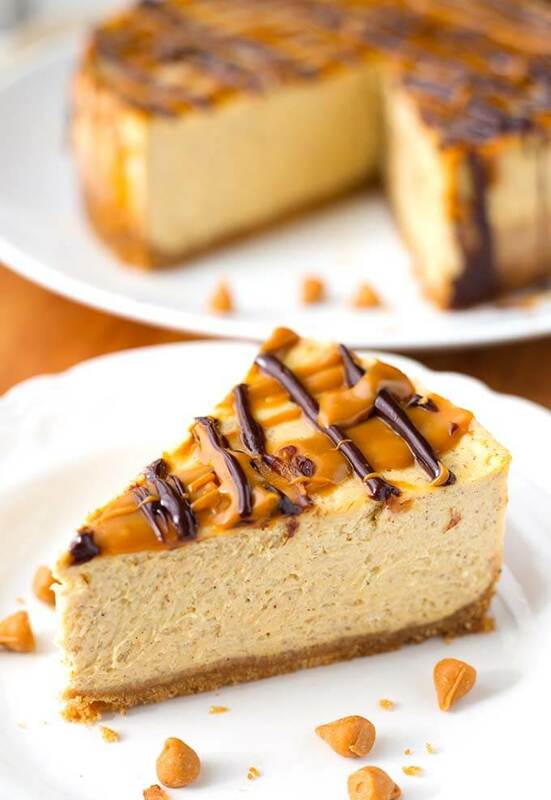 The taste of this pumpkin cheesecake is fresh, and not too sweet. I use my Homemade Pumpkin Puree rather than canned pumpkin. It is so sweet and fresh tasting! It is perfectly fine to use canned. Just make sure it is pure pumpkin puree, and not pumpkin pie filling! I think this Instant Pot Pumpkin Cheesecake has just the right amount of spice, so it’s not going to taste like a pumpkin spice cheesecake. Actually, I think it tastes closer to a pumpkin pie, which is just what I was going for.But it’s creamy cheesecake! It has a wonderful, mildly spicy, perfectly Fall flavor. If you like it spicier, add more of your favorite spice! Also, this is not a really sweet cheesecake. I found that by adding a little optional brown sugar sweetens it a little more without going overboard. We’re going to the local corn maze and pumpkin patch this weekend! 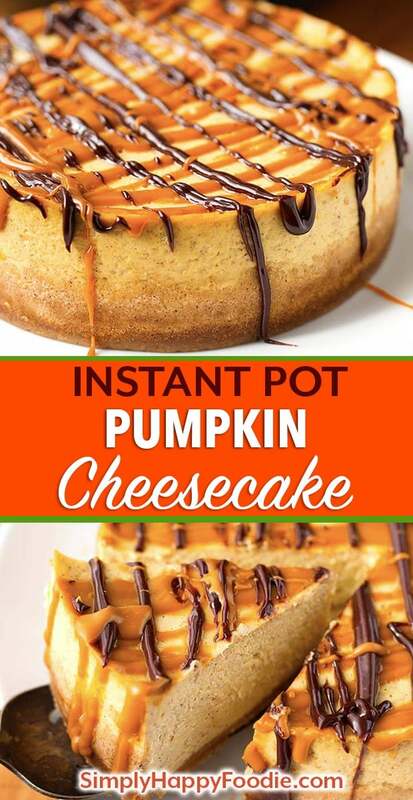 I wore a sweater today, and made Instant Pot Pumpkin Cheesecake. We are well on our way to a wonderful Fall! 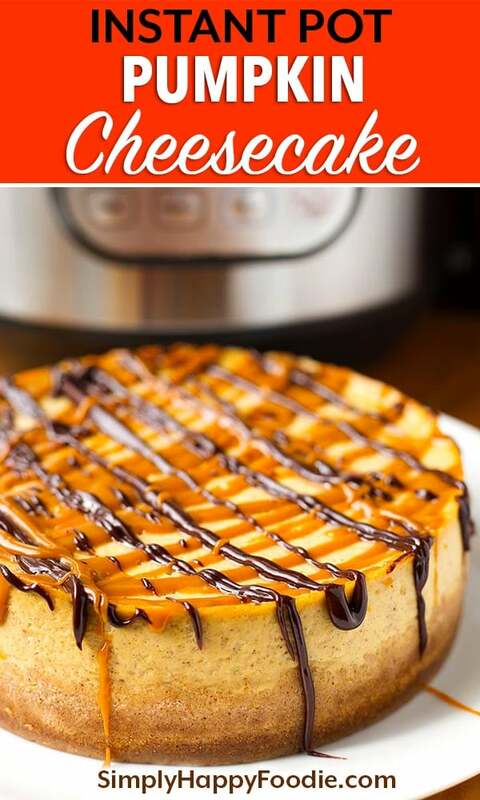 I hope you enjoy this Instant Pot Pumpkin Cheesecake as part of this beautiful season! This Instant Pot Pumpkin Cheesecake is the right blend of spices and creamy sweetness. What a great Fall dessert! You will love making it in your electric pressure cooker. No water bath in the oven, and the texture is very creamy. Spray the pan with baking spray. If you have parchment paper, cut a piece to fit the bottom of your pan and spray that too. Put 1 1/2 cups of water in the inner liner of the pressure cooker. Put the trivet in the pot as well. Usually made with aluminum foil, used to get the cheesecake in and out of the pot easily. Break up and place the graham crackers in a food processor. Add 2 tsp sugar and the ginger powder and cinnamon. Pulse several times until the graham crackers turn into fine crumbs. Add the melted butter and pulse several times to combine and soften the crumbs. You may need to scrape the bowl of the food processor and pulse a few more times. Pour crust mixture into your prepared pan and use your fingers or the bottom of a small glass to press the mixture into place. Cover the entire bottom of the pan and come up the sides just a little. You do not have to come all the way up the sides. You want the crust to be about 1/4” thick or so. Put the pan in the freezer to chill while you prepare the cheesecake filling. Clean the crust residue out of the food processor. Add the cream cheese and sugar (and optional brown sugar, if using) and process until smooth and creamy. Add the vanilla, pumpkin puree, heavy cream, spices, and flour. process until well blended and smooth and creamy. Add the eggs last and pulse just a few times. Then take the bowl off of the food processor and gently mix by hand to incorporate the eggs. It is important that you do not whip or over mix the eggs as that will ruin the texture and density of your cheesecake! Take the crust from the freezer and pour the filling into the pan. Cover the pan with a paper towel, then with a piece of foil. Crimp the edges around the pan so it stays taut and secure. Lay the sling out and set the pan on it, centered. Gather up the two ends and very carefully lift the pan and set it in the pressure cooker, leaving the sling with it. Just fold over the two ends of the sling on top of the pan. Close the lid of the pressure cooker and set the steam vent to the Sealing position. Press the Manual (or Pressure Cook) button and then the + or - button to choose 48 minutes. *** Make sure it is set to High Pressure. When cook cycle ends, let the cooker naturally release pressure for 20 minutes. Then manually release any remaining pressure. When the pin drops and it is safe to open the lid, do so carefully, facing away from you. Gather up the two ends of the sling and VERY carefully lift the cheesecake pan out of the cooker and onto a cooling rack. Leave covered for about 10 minutes, it will continue to cook, then carefully peel off the foil/paper towel. The cheesecake is done if the center couple of inches jiggles just a little bit when shook. You don't want it too jiggly, but you do want some. It will firm up as it cools. If it is too jiggly, cover it back up and put back in to cook for 10 more minutes, with a 15 minute natural release (times will vary with many factors such as altitude and the size of pan, and the model of pressure cooker). Let cool for about an hour, then put the pan in the fridge to chill for at least 4 hours before serving. I prefer to make my cheesecake in the evening and let it cool overnight. This is not a specific recipe as you don't need much for a drizzle. In a microwave safe bowl, add a handful of chocolate or butterscotch chips. Add a couple teaspoons of heavy cream and microwave for 25 seconds. Stir slowly at first so the cream doesn't fly out of the bowl. Then keep stirring and the ganache will come together. If it is too thick, add a little more cream, and warm for 10 seconds in the microwave again. Then stir more. It will come together! This is a very forgiving sauce! *Note: The chocolate melts faster and easier than the butterscotch. *This is not a really sweet cheesecake. If you like a sweeter cheesecake, add 1/4 cup of brown sugar or white sugar to the filling. **If you have a smaller pan that is taller (like a 6"x4"), increase the cook time by 5 minutes. --- Original cook time has been updated to 48 minutes. I have great results at 40 minutes, but it seems many people need about 5 minutes more, so I just changed it. It might be because I am right at sea level. If you have a 6" pan that is 3" tall, you might not be able to get all of the filling in the pan (in which case, shorten the cook time by 5 minutes). When I say that I mean that it puffs up in the cooker, and sinks back down as it cools. There is a chance it will puff up too high and spill out while cooking. You might have to leave out a small amount of the filling. I like to leave about 2 inches of headroom (I have not made this recipe in a 6"x3" pan). UPDATE: If you use all of the filling in a 6"x3" pan, cook for 10 extra minutes, and a 15 minute natural release. ***Altitude, etc. affects cook time, so adjust accordingly. If it is too jiggly when you take it out, just put it back in for 5-10 minutes with a 15 minute natural release, depending on how jiggly it is. I loved this! I didn’t have heavy cream, or even whole milk, but couldn’t wait to make it, so I used 2%, but added a half tbsp of melted butter to the milk to imitate the richness of heavy cream. It was great! Not too sweet, and not overwhelmingly pumpkiny. My husband kept eating it while it was warm, and had to be chased off with a wooden spoon. I was wondering though, what your thoughts would be about using gingersnap cookies for the crust. Would that work OK? And roughly how much should I use? I suppose I could crush the Graham crackers an measure the amount, and then just do that much, but i thought I’d check if you knew offhand? Ardrey, as for the gingersnaps, yes, I have used them! 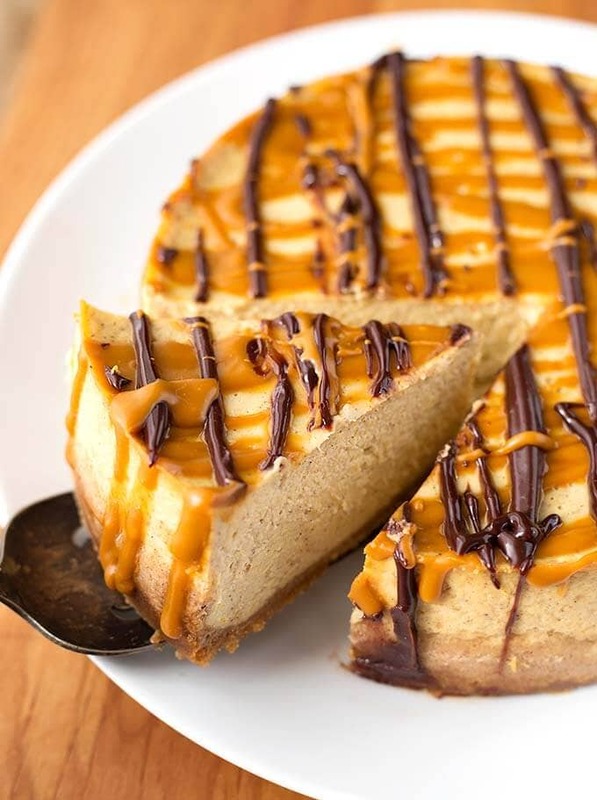 I would use half of the gingersnaps and half graham crackers (or 2/3, 1/3) as those cookies can be very spicy, and this pumpkin cheesecake could get overpowered. I would say 1 1/4 cups of crumbs. You could also add more ginger to the graham crackers. Thank you for the nice comment, and the Five stars! 😀 I read what you wrote to my husband and he laughed! I just made the pumpkin cheesecake,it looks and smells wonderful. I’m confused if I put the topping on before or after it’s cooled for 4 hours. Hi Diana, you put the drizzle on after it has cooled. Otherwise it will melt. I hope that helps! Enjoy the cheesecake! Just wondering re the length of time. I just bought a leakproof 7″ springform dark metal pan that fits into my IP 6Qt. and I tried a plain cheesecake in it, which came out ok. But, I really want to try a pumpkin cheesecake recipe! 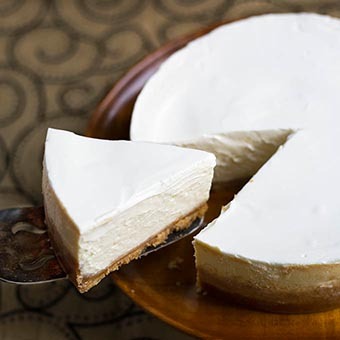 I am finding in lots of other cheesecake recipes, the recipes are around 32-34 minutes for the springform pan. It was highly recommended on Amazon. As a newbie, what should the high pressure time be? Thank you! Hi Valerie! This cheesecake takes longer, as there is the pumpkin puree in it. I would cook it for 50 minutes, with a 15 minute natural pressure release. After you open it, wiggle the pan. There should be just a bit of jiggle in it. It will set up in the fridge! Let me know how it turns out! Thanks Sandy! I will make it this week! I just made this as a test for Thanksgiving! I’m going to take it to a church potluck tomorrow so we can’t taste it, but it looks great so far. Cooling in the refrigerator now. Mine cracked just a tiny bit on the top at 55 mins, but it was fairly jiggly. I may try the 50 minute time next time. I’m in MN; google tells me 991′ feet above sea level. Thanks for the recipe! Hi Julie! I hope everyone is impressed and enjoys it! I made a cheesecake last night that cracked, too. I just poured chocolate ganache all over it! But, yes, I think I’ll cut the time back 5 minutes. It’s funny how it is different for where you live! Can you use lowfat cream cheese in this? From what I have heard from other people, it works well, though I personally haven’t. Thanks for your recipe! My cheesecake is in the IP cooking. Can’t wait to taste it. Just wanted to mention that the filling is too much for a regular 7″springform. Put extra in a small ramekin. My springform is only about 2″ high whereas Fat Daddio’s is 3″. I’m going to have to get a Fat Daddio’s. Hi Linda, Yes, I agree about the 3″ Fat Daddio’s. Such a great pan! Good for lasagna, too! I’m so happy you are making the Pumpkin Cheesecake! It is so good! I hope you like it. I’m going to be making some adjustments to the recipe, but not for a while (only some cooking tweaks, not ingredients). Let me know! I have a 4 inch springform pan. How long should I cook it on the instant pot? Also should I just halve the ingredients? Thanks! This recipe will make 4 4″ mini cheesecakes. Reduce cook time to 18 minutes and a 10 minute natural release. I haven’t tested it with this recipe, so this cook time is approximate. Hi Sandy, my pumpkin cheesecake is in the Instant pot can’t wait for it to be done. Your video for this recipe is great and very helpful!! Thank you for exactly what I was looking for for thanksgiving! Awesome, Gina! I hope you enjoy it! This was the best pumpkin cheesecake I ever had! I did a trial run for Thanksgiving. I’m definitely making this again! That’s awesome, Heidi! I’m so glad you liked it! Thank you for your review! Absolutely amazing cheesecake. I dont even like pumpkin pie, but I gave this a shot and it was great. The texture is amazing in the instant pot, and my cheesecake came out with not a single crack on it. I didnt even have to put the toppings on it, it tasted good without them. Thank you for the recipe!! Awesome! Thank you so much for your review! 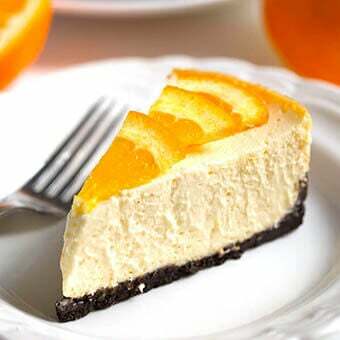 I’m really happy to know you liked this cheesecake recipe! So, have the pumpkin cheese cake in the IP as I’m writing this. I did make a boo boo tho. I inadvertently left the heavy cream out. It’s measured out & everything but saw it after I’d put the cheese cake in the IP & fired it up. What do you think the result will be? It will be fine! A little denser, but it will be good! I’m coooking my cheesecake now, but am a little confused about the cook time. Recipe says 48 minutes, Recipe Notes say 35-40 minutes, one of the comments says 50 minutes. I’m at sea level and set mine for 42 minutes. I’m thinking of adding a couple minutes. Is there a consensus on which end of the 35-50 minute range works best at sea level? Thanks! 45 to 50 minutes is what it’s supposed to say!